I have started loving various international cuisines. I am trying to prepare a fusion dish by blending the Indian vegetables in different recipes around the world. In simple words, an international cuisine fit for an Indian family. A few samples from my stable are the Chickpea Burger, Spinach Pasta and Quick Pizza etc. 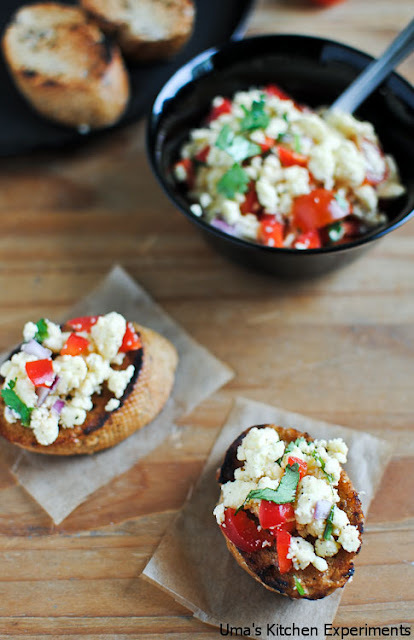 Now in a similar manner, I have prepared Paneer (Cottage Cheese) Bruschetta from Anjum Anand's "I Love Curry". This fusion dish came out very well and everyone in my family liked it. Next time, I am planning to make my own Indian version of topping thereby trying to experiment more on fusion dishes. 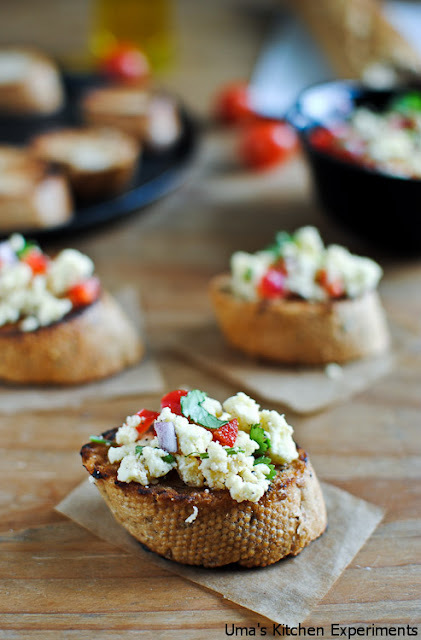 Bruschetta is an Italian Snack or Appetizer which consists of a toasted bread slice topped with meat or any vegetables. It is very easy to prepare and only the topping differs from one variety to another. You can be creative with the selection of the topping so as to make your own version. 1) Take the crumbled panner in the mixing bowl. 2) Add onion, capsicum, coriander leaves and cherry tomatoes. Toss it well. 3) Season with salt and pepper. Add olive oil and toss well again. Taste and adjust the seasoning. Keep it aside. 4) Coat both the sides of bread slice with olive oil and toast it in the pan/skillet untill crisp and slightly turns brown. 5) Place generous a or two tablespoon of mixture on the bread slice and serve. 1) Instead of toasting the bread, you can also bake them. Place the bread slices in the 180C preheated oven and bake it for 5 minutes or until crisp. 2) Try to use fresh paneer for best results. I'm linking this recipe to Srivalli's Blogging Marathon #12 under the theme of paneer. Check out what others are cooking by clicking it here. 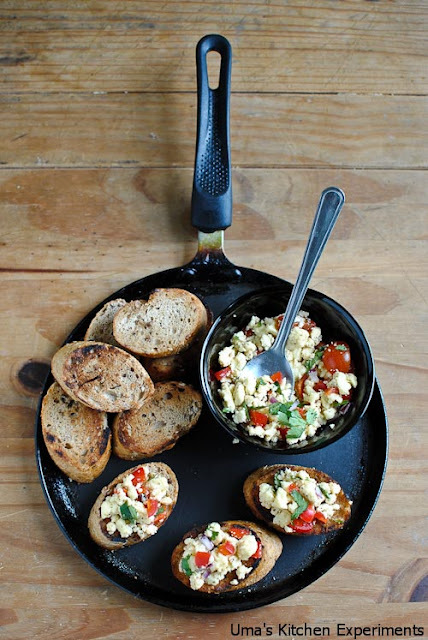 i love this Italian loaf roasting with garlic parsley butter spread...paneer bruschetta is simple and sounds yummy!! 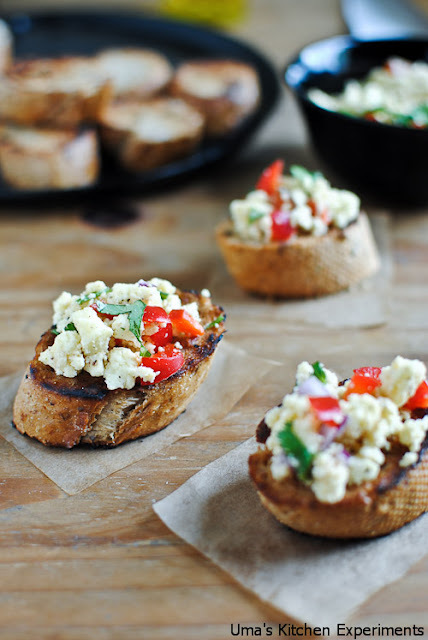 Delicious and very yummy bruschetta!! This looks wonderful and yummy !! Looks yum and tasty ..
Look so yumnmy!!! Wonderful clicks. The first picture is mindblowing. Nice recipe..
wonderful fusion dish Uma..excellent clicks n presentation.. Brushetta!! I love the ones that are served in one of the Italian restaurants we frequent here..Gr8 recipe..
Yummy, looks so easy and tasty. I like the texture on the loaf..look really cool! !..lovely presentation too....delicious!! Hey looks so good! Nice pics...waiting to see what you're gonna post today! 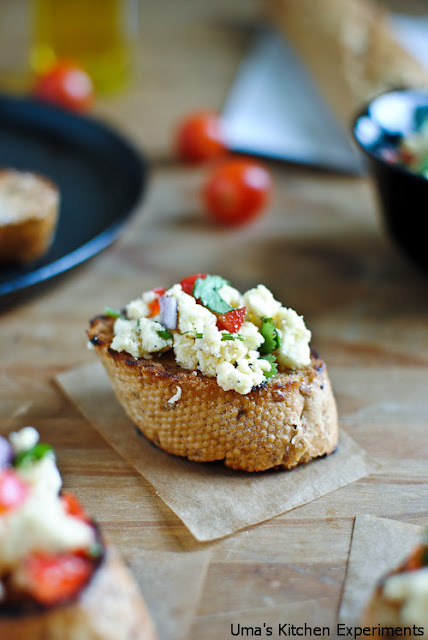 Paneer Bruschetta looks absolutely irresistible and terrific..
Nice recipe and beautiful clicks Uma. I love paneer and your photos do justice to the recipe.Beautiful! Lovely clicks with an indian twist...yummy!! This is one of my favorite appetizer. looks super good Uma..love your neat pics. Looks amazing. Straight out of a food Mag..! Loved it..! Gorgeous clicks!! And a wonderful recipe! Lovely party dish! Very colorful and splendid pictures! OMG These look awesome. Gr8 job dear.